I prefer Homburg to A Whiter Shade of Pale. Trust me, if you’re over fifty you can delude yourself into thinking this qualifies as a hot take. Sometimes, if I’m waiting for a delayed train or grimly staring at a yet-to-boil kettle or idly wondering if I’ll live long enough to see Phelan get his comeuppance on Corrie, Homburg’s wearily philosophical opening lines drift unbidden into my mind’s ear – “Your multilingual business friend has packed her bags and fled, leaving only ash-filled ashtrays, and the lipstick [sic], unmade bed” – and I always wonder why this gorgeous vignette could only reach No 6 in the UK charts when A Whiter Shade… floated all the way to the top? Well… come on. Has anything ever held a magic mirror up to the zeitgeist as flatteringly as A Whiter Shade… did in the early summer of 1967? Here’s a hypothesis. By the time Homburg came along, it was October, and it was raining; everyone was shivering and sneezing, and wiping their noses on their lace sleeves. A few weeks later, the pound was devalued, and no one was really in the mood to countenance something as similar in tempo and texture to A Whiter Shade…, which already seemed like a half-remembered, guiltily indulgent reverie from a preposterously frivolous time. Something like that. It’s all academic now anyway. 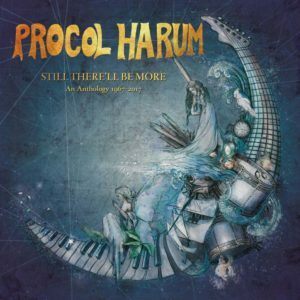 Procol Harum’s catalogue has been rinsed more often than Derek Acorah’s bouffant, but this is an object lesson in curating a legacy with care, consideration and observance of the proper, ah, protocol (Harum). Three of the discs mop up a gratifying number of highlights from the band’s fifty-year career – if we overlook the hiatus between 1977 and ’91 – while two discs are given over to concerts from the Hollywood Bowl in September 1973 and Bournemouth Winter Gardens in March 1976, the latter previously unreleased. The three DVDs, meanwhile, are high-resolution gold, including complete live studio performances from Beat Club in 1971 and Musikladen in 1973 – so complete that they include snatches of conversation between songs, false starts, an unspecified person farting, and so on. The overall picture is of a terrific band who perhaps overreached on occasion when following the “symphonic rock” script too assiduously. All nineteen torrid minutes of In Held ’Twas In I with the Edmonton Symphony Orchestra are pretty sobering, even to prog apologists like this one; and The Blue Danube, from the Bournemouth concert, is immaculately inexplicable either as an homage or a pisstake. But then you remember the grainy gravitas, head-spin chord progression and creaking timbers of A Salty Dog, worthy of mention in the same sighing breath as Surf’s Up, and reflect on the way Grand Hotel’s lofty decadence is essentially the first two Roxy Music albums minus the critical consensus. They excelled at these rueful tangos (see also Skating on Thin Ice, Something Magic and The Emperor’s New Clothes) – and, almost despite themselves, were a vivid and visceral singles band (Pandora’s Box, Conquistador, Quite Rightly So). The fact that the muscular Nothing But the Truth didn’t even crack the Top 75 is as infuriatingly baffling as the popularity of Mrs Brown’s Boys.